Fox is planning for a X-Force movie. What is X-Force? It is a more ruthless, battle hardy team set up by the X-Men to battle the worst threats on the planet. This is pieced together speculation on my part but there are some facts to back this up. (Creator of X-Force) has said for awhile that there is a plan for X-Force to show up. He continues to say this. There have been some awesome X-Force comics recently. 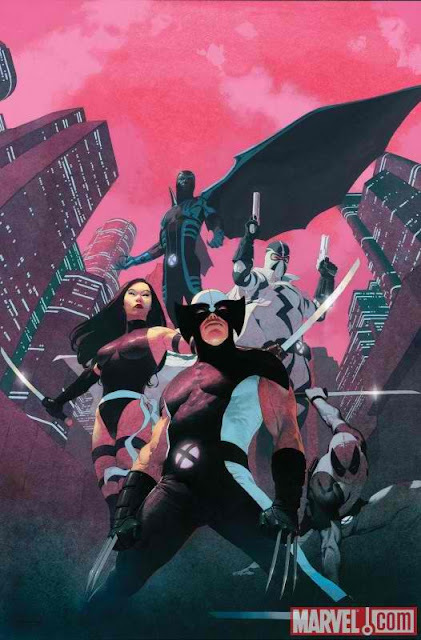 Uncanny X-Force was flat out crazy amazing. Fox is watching the new material closely and the emergence of X-Force in comic form has their mouth's watering. The major villain X-Men's upcoming movie is the major cause behind the creation of the initial X-Men team. Where there is an Apocalypse there will soon come an X-Force. Simon Kinberg's comments on how the Deadpool movie will tie into larger events across the X-Verse. Keep in mind Deadpool has a long history with X-Force both as a villain and a member of the team. "They do all feed into one another in the sense of wanting to tell this sort of massive story that can take place over multiple movies,"
"We are aware [of that] as we are plotting out X-Men: Apocalypse and the other X-Men movies – both potential sequels in the future and standalone movies – and trying to build them all together so that there is a singularity of vision. And obviously a timeline that makes sense as well, because these movies all, well not all, but many of them take place in different time periods, so that all those things will link up and make sense for an audience." Benedict Cumberbatch to play Doctor Strange! What is the Iron Man armor Model I Mark I? Who kidnapped Beth on Walking Dead? Is Flash the new king of comic book TV? Ethan Hawke is Doctor Strange?